Integrity | ADULT CATECHESIS & CHRISTIAN RELIGIOUS LITERACY IN THE ROMAN CATHOLIC TRADITION: hosting ONLY True Christians!! !, or "How to think Catholic!!" -by DeMarco, Donald, “The Virtue of Integrity”, Lay Witness Magazine, (October 1999). “We need integrity to become who we are, so that we can complement God’s gift to us with our gift to Him. At the opposite ends of the moral spectrum are holiness and multiplicity. This pairing of polar opposites may seem odd at first, but it is solidly biblical. Holiness is so named because it represents wholeness or unity of personality. God is eminently holy and His saints are holy to the degree they emulate Him. According to traditional orthodox teaching, God, Who is the fullness of Being and of every perfection (Catechism, no. 213), has the character of simplicity. For St. Augustine, God is truly and absolutely simple. And for St. Hilary, God, Who is strength, is not made up of things that are weak; nor is He, Who is light, composed of things that are dim. Multiplicity is fragmentation, fractionalization, dispersion, dividedness. It is captured in the colloquial expression going to pieces. Multiplicity in this sense also corresponds to the notion of diabolical, which literally means going off in opposite directions. In Mark 5:1-20 and Luke 8:26-39 we read about the man who lived in the country of the Gerasenes who was possessed by an unclean spirit. The poor man was out of sorts, to say the least. He would howl and gash himself with stones. Quite literally, he was out of control. His fellow countrymen would bind him with chains and fetters. But he would break the chains asunder, tear the fetters to pieces, and be driven by the devil into the desert. This poor man submitted himself to Christ, Who commanded the unclean spirit to declare its name. Legion, was the response, for many devils had entered him (Lk. 8:30). Christ then allowed the legion of devils to enter a herd of swine, approximately 2,000 in all, who then rushed with great violence into the sea and were drowned. This spectacle of mass disintegration was indeed terrifying to the swineherds who reported the event to their townsfolk. The word holy from Old English: hālig meaning “wholeness”. The difference between God and the devil is the difference between simplicity and multiplicity. We human beings cannot hope to achieve simplicity, but we can achieve integrity and avoid multiplicity. A favorite theme among 20th-century writers is the fundamental moral importance of personal integrity. The word they often use to describe this state is authenticity. A person should be himself, they insist, and not divide himself into incompatible parts: one for himself and another for the masses. Because our unity of personality demands the integration of its parts, there is always the possibility that we can break up (dis-integrate) into discordant pieces. But what are these parts that must be integrated if the person is to be whole? There are many lines along which personality can be unified. There is the integrity between word and deed, friendship and fidelity, private life and public life, mind and body, head and heart. But the integrity that is perhaps most basic to a human being is the one that binds one’s being to one’s behavior, endowment to achievement, or giftedness to response. God has given us our inheritance and an inclination toward our destiny. We are free to reject this inheritance because we do not think it is good enough. Thus, we may spend our life envying others whom we judge to be more talented, intelligent, attractive, and so on. Or we may decide not to make the effort of claiming our natural inheritance so as to fulfill our destiny. The great Christian existentialist Søren Kierkegaard distinguished these two dispositions, respectively, as the despair of weakness and the despair of defiance. 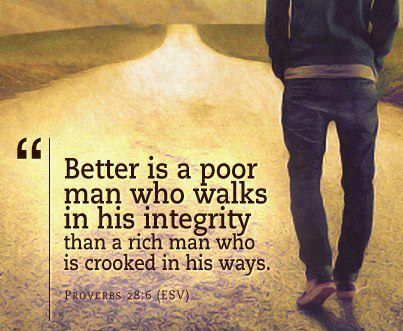 We need integrity to become who we are, so that we can complement Gods gift to us with our gift to Him. Although we often lack integrity in ourselves, we are usually quick to recognize and denounce it in others. So it was with that great cinematic legend of yesteryear, the Lone Rangers trusty sidekick, Tonto, who instinctively distrusted the white man who spoke with forked tongue. We detest phoniness, hypocrisy, duplicity, double-dealing, and disingenuousness. 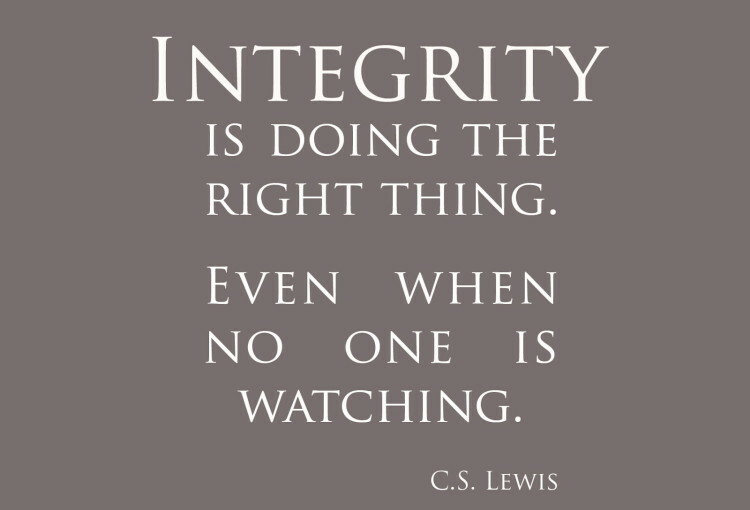 We admire integrity, though we know that it often comes at a high price. Specialization and bureaucracy contribute heavily to the process of disintegration. Politics is another area that poses a formidable challenge to anyone who wants to retain his integrity. On the abortion issue, for example, one commonly hears about politicians who are privately opposed but publicly in favor of it. Charlton Heston stood up at a Time/Warner stockholders meeting not too long ago and read the shocking lyrics of certain rock songs that passed for entertainment in the judgment of that corporation. He said that he expected he would never again be invited to make a film with Warner Brothers and would win many enemies, but that he had a moral obligation to do what he could to start cleaning up some of the filth that is demoralizing contemporary society. He announced to his stunned audience that his integrity meant more to him than his status in the eyes of Time/Warner. As he read the lyrics that were rife with sexism, racism, and violence, The Time/Warner executives, according to Heston, squirmed in their chairs and stared at their shoes. “They hated me for that.” Nonetheless, much good did result from his address.